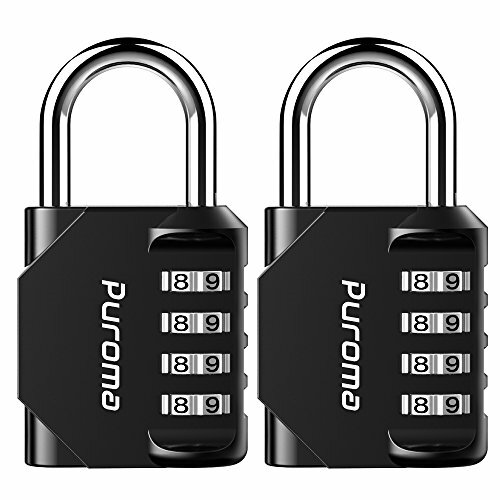 Puroma 4 Digit Locker Combination Lock is strong and built to last for better keeping your own belongings and setting your mind at rest while doing your sports or job. A special design of the combo side window provides you a clear view while setting your code. It can be resettable and 10,000 combination codes formed by 4 digit numbers make it safe for daily use. How to set your own code? 1. Make sure codes are set to default (0-0-0-0). Pull up the shackle and turn it to the code setting gap. 2. Push the shackle down until the tiny pin is fully inside the gap. Hold it there and turn the shackle counterclockwise to the code line. 3. Scroll the numbers to set your own combination code, making sure the numbers are completely in the windows. 4. Turn the shackle clockwise until it pops up. Remember your new combination. To avoid damaging the lock, it's NOT recommended to turn the shackle over the code line. Please make sure the numbers are completely in the window when setting a new combination. Please remember your new combination code you have set. Special Design: Compact size, light weigh, and convenient for you to store and carry. Side windows for easy combination viewing. High security : 4-digit offers 10,000 combinations for added security compared to 3-digit. Set your mind at rest while doing your sports or job. Resettable: Numeric combination design makes it easy to set and reset your own preferred combination and hassle-free to carry the key. Widely use: Suitable for school gym locker, sports locker, fence, toolbox, case, hasp storage and etc. Bonus: Package comes with 2 packs of zinc alloy 4-digit resettable combination locker locks. Idea gift to your friends, classmates, and etc. View More In Lockout & Tagout Products.